Over the weekend the boyfriend graduated from Law School. I'm super proud of him, he worked so hard and I know he is glad to have a break from stress before he starts studying for the bar. The other good news that stems from him graduating is that we no longer have to be long distance. It was hard but totally worth it, and being able to come home to him every night now is so AWESOME!!! Love that guy! Anyways, to celebrate his graduation, I did a manicure sporting school colors. These are fairly simple for me, but I did like them. I started off with a base of OPI Glints of Glinda. This color is the perfect base for a french manicure. 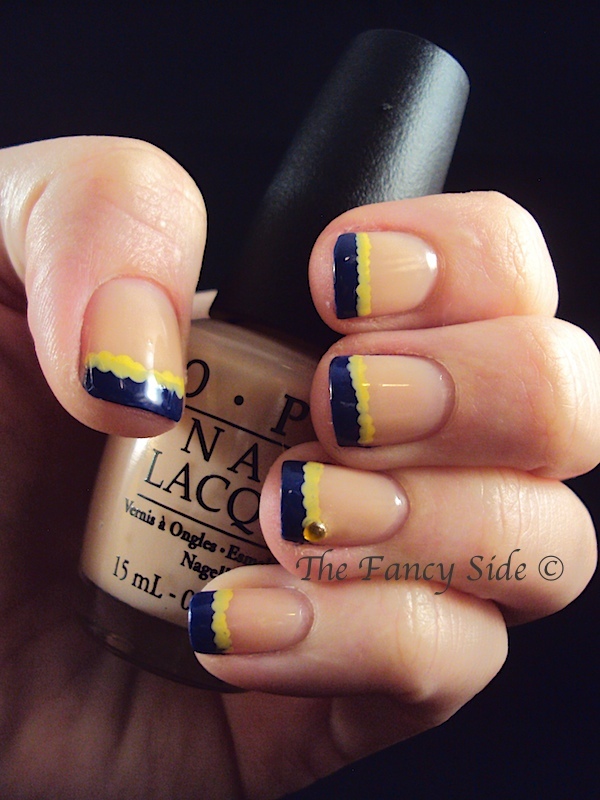 I then freehanded tips in OPI Eurso Euro. Next, I added rows of tiny dots in Sally Hansen Xtreme Wear Mellow Yellow. 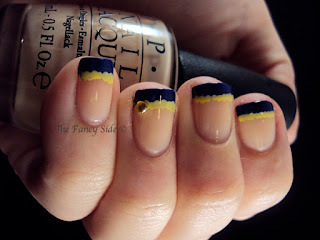 On the ring finger I added a rhinestone in yellow as well, just an added little pop. 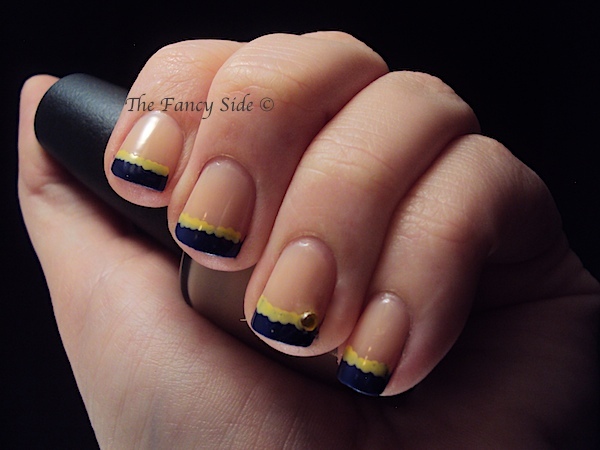 If I had to do this mani over again, I would have taken the time to tape off straight lines for the yellow and the blue, but you know what they say about hind sight. Have you had any big changes in your life lately? Congrats to your boyfriend! I love Glints of Glinda, looks so cute. Thanks! I'll tell him. I love GoG too. I just wish it would build up opaque as well. Thanks! He's so relieved to be done. Now he just has to pass the bar. Dun dun duuun!